This volume takes up the challenge embodied in its predecessors, Alternative Shakespeares and Alternative Shakespeares 2, to identify and explore the new, the changing and the radically ‘other’ possibilities for Shakespeare Studies at our particular historical moment. 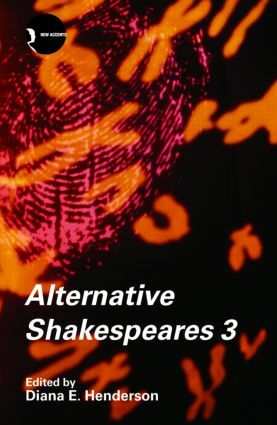 Alternative Shakespeares 3 introduces the strongest and most innovative of the new directions emerging in Shakespearean scholarship – ranging across performance studies, multimedia and textual criticism, concerns of economics, science, religion and ethics – as well as the ‘next step’ work in areas such as postcolonial and queer studies that continue to push the boundaries of the field. The contributors approach each topic with clarity and accessibility in mind, enabling student readers to engage with serious ‘alternatives’ to established ways of interpreting Shakespeare’s plays and their roles in contemporary culture. The expertise, commitment and daring of this volume’s contributors shine through each essay, maintaining the progressive edge and real-world urgency that are the hallmark of Alternative Shakespeares. This volume is essential reading for students and scholars of Shakespeare who seek an understanding of current and future directions in this ever-changing field.